Hi, This is a tutorial for “How to resolved battery drain problem after updating OS”. In this guide you will find all steps with image, therefore it is safe and easy method of resolved battery drain problem after updating OS. Updating the software of smartphone is very important. Due to this process, we get rid of the small problem which is being created in our smartphone. But just think if after the updating the software we face more problem in our smartphone in this condition what will you do? Many times, after updating the software the mobile uses more battery. In this condition users either restart the phone or bring to the service Center For removing these problems. we are going to give you some tips, which is very useful for you and you will solve this problem very easily. update the all apps of phone: Update the all apps which is installed in your phone. Due to this the bug of apps get fixed. lock the widgets on your lock screen: If u have set the widget on your phone, then remove the some of them. Widgets work continue therefore battery of your phone get low. Restart the phone: This is very useful method. Once restart the phone. Sometimes some problems get occurred which is removed by restart the phone. Close the background apps: Close the apps which is working in your phone. Although apps is not updated and have no bugs yet these problem can get occurred. Turn off GPS of your smartphone: Always turn off your GPS. On the GPS ON only when you OR phone apps have need. GPS use more battery as usual. If use have on GPS battery get low. Have phone on the low power mode: If battery get low fast, then have your phone on low power mode. 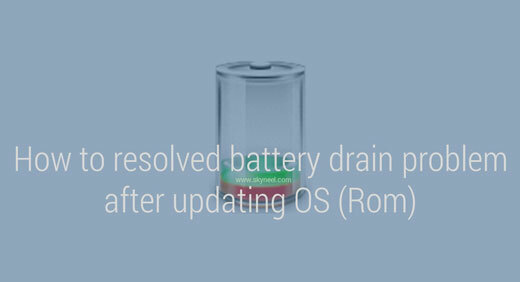 I hope you like this resolved battery drain problem after updating OS guide from which you will be able to easily resolved battery drain problem after updating OS without any extra efforts. If feel any problem in this guide then please use comment box. Thanks to all and use your smart phone smartly.